The Quesada Seleccion Espana Petit Belicoso is the seventh size to be made in Quesada’s Seleccion Espana line. 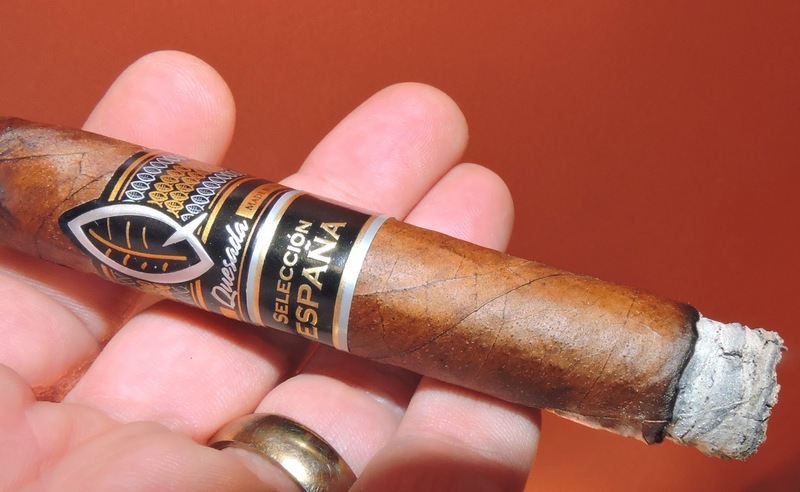 It is a very limited release that is the third vitola to be released in what we refer to as Quesada’s “one box, one retailer, one month” concept. In 2013, Quesada Cigars selected one retailer per month to receive one box of 50 of the Quesada Seleccion Espana Lancero. The concept continued in 2014 with the Quesada Seleccion Espana Ninfa. A 4 1/2 x 40 Petit Belicoso was selected as the size for 2015, but the box counts were increased for 2015. Recently I’ve had an opportunity to sample the Quesada Seleccion Espana Petit Belicoso. I found the Petit Belicoso to be a great size of Quesada Seleccion Espana blend and one that delivers a great cigar experience. 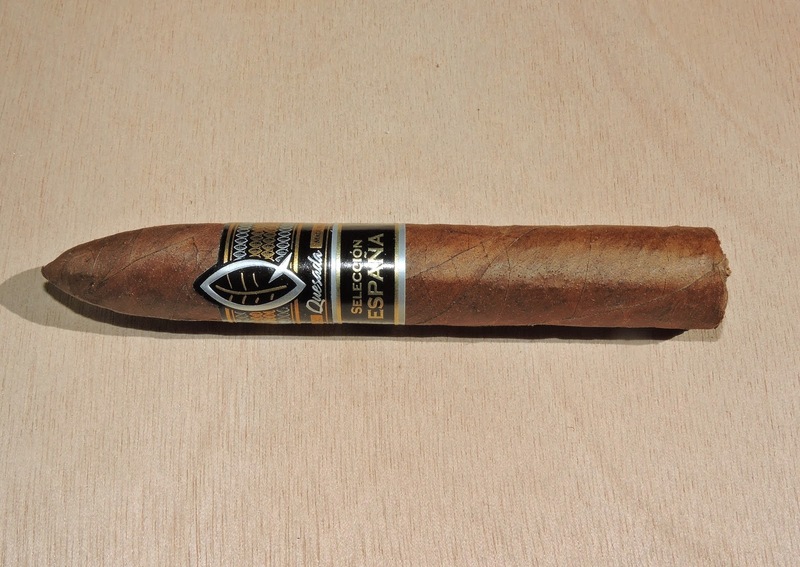 The Quesada Seleccion Espana made its debut in 2011 at the ProCigar festival. It was originally intended for the cigar market in Spain, but based on demand it was released to the U.S. market. It has remained a mainstay at many of Quesada’s top accounts since then. At press time, two retailers have been selected (January 2015, February 2015) for the “one box, one retailer, one month” concept for the Quesada Seleccion Espana Petit Belicoso . In January Just for Him in Springfield, MO received the first box. In February, Union Cigar Company in Monroe, NC received the second. The Quesada Seleccion Espana is a multi-national blend. The cigar is made at the Quesada Cigars factory in the Dominican Republic. * Part of Quesada’s one retailer, one month, one box concept. Twelve retailers received a single box of these special sizes with a different retailer selected each month. In 2013 and 2014 the Lancero and Ninfa came in 50 count boxes. In 2015, the Petit Belicoso came in 100 count boxes. The Arapiraca wrapper has a light roasted coffee bean color. There is some oil on the surface of the wrapper. There are thin visible veins and some visible wrapper seams. As for the belicoso tip, I found this to have a somewhat sharper taper. There are two bands on the Quesada Espana. The first is the silver, black band that is seen on many Quesada cigars. It features the large silver and gold Quesada “Q”-shaped leaf logo. Below the leaf is the text “Quesada” in silver cursive font. To the left and right of this text is a gold stripe. On the left stripe is the text “DOMINICAN REPUBLIC” in small etched font. On the right stripe is the text “MADE BY HAND” in small etched font. Finally, surrounding the leaf logo to the left and right are silver and gold rows of miniature “Q”-shaped leaf logos. There is a second band that is also black, silver, and gold. On the black background is the text “ESPANA” in large gold font. Just above that text is the text “SELECCION” in small silver font. There is silver and gold trim. Kicking off the cigar experience, I went with a straight cut to cut the belicoso tip. I went about 1/2 of the way down the tip to remove the tip. I went a little further with the cut because of the small size of the ring. Once the tip was removed, I moved on to the pre-light draw. The dry draw provided some notes of cocoa. There also were some subtle notes of pepper, earth, and cherry sweetness. Overall I considered the pre-light draw of the Quesada Seleccion Espana Petit Belicoso to be very good. At this point I was ready to light up this cigar and see what the smoking experience would bring to the table. The start to the Quesada Seleccion Espana Petit Belicoso provided a mix of red pepper, chocolate, and cedar notes. While I picked up some red pepper on the tongue, the retro-hale seemed to produce more of a black pepper in the nasal passages. Early on, the chocolate notes seemed to be primary, but as the flavor profile developed, the chocolate and cedar interchanged as to what was the primary note. Meanwhile the pepper notes were secondary and were joined by an earth note. During the second third, I found the chocolate and cedar notes continue to alternate in terms of what was the primary note., but now the earth notes found their way into the rotation. The red pepper still remained secondary. I also picked up some cherry sweetness in the background. As the Petit Belicoso moved into the second half, the chocolate notes played less of a role and the earth and cedar were more prominent. During the last third, I picked up more in the way of cedar spice and earth. The red pepper notes were now pretty close to the forefront. There still were some notes of chocolate and cherry that could be detected. This is the way the Quesada Seleccion Espana Petit Belicoso came to a close. The resulting nub was firm to the touch and cool in temperature. Overall I found the Quesada Seleccion Espana Petit Belicoso to burn as well as any belicoss I have had. Keeping the burn line straight, was low maintenance and pretty much remained sharp on each cigar I had. Occasionally the wrapper was prone to blistering, so I had to be gentle on any touch-ups I made. The resulting ash was tight and firm with a nice white color. The ash came off the Petit Belicoso in nice clean chunks. The burn rate and burn temperature were ideal. I found the draw to be outstanding as well. It had a slight touch of resistance – which is something I like. Normally when I take half a tip off a belicoso, it is prone to get soft. There was no such issue with the Quesada Seleccion Espana Petit Belicoso. From a strength perspective the Quesada Seleccion Espana Petit Belicoso to be on the upper end of medium falling just short of medium to full strength. With this blend, I’ve found these to mellow slightly over time (to the lower end of medium), so I’m curious what long term aging will do to strength-wise to this cigar. As for the body, I found the Quesada Seleccion Espana Petit Belicoso to start out medium-bodied. By the second half, the body progressed to medium to full-bodied. In terms of strength versus body, I found the body had the edge. Typically I have found the Quesada Seleccion Espana to be a cigar that has needed some time once it hits the shelves. The Petit Belicoso definitely has been the cigar that has been the “most ready” to smoke of any of the sizes I have had to date. The nice thing is the track record on how this blend ages could make the sky the limit on this blend. I’ve also found the smaller ring gauges (Corona, Lancero, and now Petit Belicoso) are where the Quesada Seleccion Espana blend has shined. The Petit Belicoso proved to be an excellent format as well. This is a cigar I would recommend to a more seasoned cigar enthusiast, but would not discourage a novice to try this one. While these comes in boxes of 100; if this is normalized to a 20 count box, this is easily a box worthy cigar. It’s definitely a cigar I would smoke again.